In a few days’ time, I will be journeying to the ‘Top of the World’ – The Arctic! I’ll be searching for polar bears, walrus, seals, Arctic fox, Beluga whales and more, across glaciers, fjords, ice tundra and through the Arctic seas. In prelude to the Arctic expedition, I’ll be trying out some land-based adventures such as dog-sledding with huskies! Hugs + huskies = Dream Of A Lifetime!! It is a frontier voyage, which brings an entirely unique set of challenges during every expedition – a reminder that these journeys to the ends of the Earth are truly a pioneering miracle of the modern era. I was craving a new travel challenge. My first non-European solo trip was to Ethiopia several years ago. Last year, I ventured through Iran and wandered solo around Tehran, the sprawling capital city. This year, I wanted something utterly unique and presenting a different style of travel. Those who follow my journeys across continents know that wildlife and nature are a first love. There is simply nothing more magical than seeing the majestic creatures that roam our planet, in their own natural habitats. It is the ultimate privilege of travel. I have not long returned from nearly a month in Madagascar – that was the polar opposite (couldn’t resist!) to this Arctic voyage. It was a challenge. But it’s Africa, the Indian Ocean, hiking, heat and humidity – I’ve had a lot of experience with all of those, so I was less anxious than I am right now. I feel particularly nervous, as there is an aspect with which I’m not all too familiar, nor great at coping: THE COLD. By cold, I mean bitterly cold. I’m expecting temperatures to hover around the freezing mark, at best, as it is summer after all. In the capital of Svalbard, temperatures may even reach a balmy 8 deg C! But on the expedition, winds and icy rain could make the real feel a whole 10 degrees below freezing. 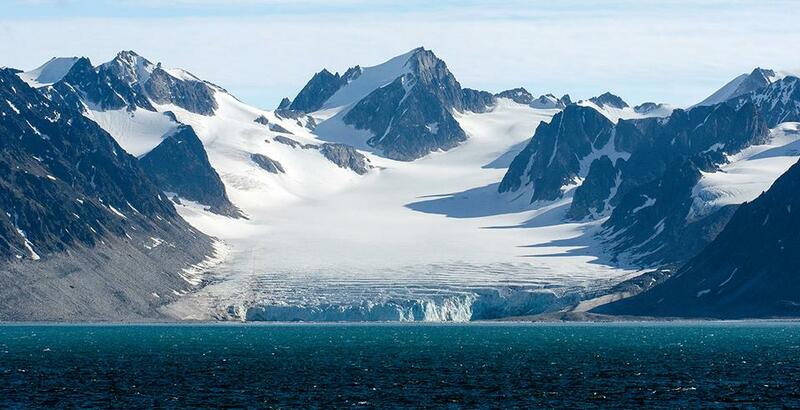 The journey I’ve chosen is the M/S Expedition ship around the Spitsbergen region, close to the North Pole. The ship is operated by G Adventures, who have plenty experience, knowledgeable guides and good safety standards. Most importantly, for me, on-board I’ll be regaled with talks and lectures about the wildlife, Polar Regions, global warming and conservation – issues that matter to me. I’ll be sharing a cabin on-board the ship, with another female passenger. Luckily, I’ll only be sharing with 1 person, as I know that there are cabins with upto 4 sharing. But I haven’t shared a room since…well, I don’t remember when. It’s simply about being able to close the door and have my own space for a little while –throwing on something comfy and relaxing in my own ‘den.’ Ok, maybe even talking to myself (kidding!) So this will be a new experience as an adult. But I’m positive it may actually be nice to have a roomie with whom I can share such a special journey and de-brief on our 2-3x daily outings. Continuing on the theme of having my own space – I’ve never been a fan of ‘cruising.’ Nothing against it but I just never felt it was for me. Having said that, I did cruise around the Galapagos, but that was on board the small ultra luxurious Yacht La Pinta ship, which only had very few passengers at capacity. So, to be on a ship with around 130 people will certainly be a different experience. I am very very hopeful that I’ll come away with an entirely different perspective on cruising. What will be exciting is that days are long – starting with 5am wake-up calls and heading to bed at around midnight. Even then, a wildlife spot would mean jumping out of bed, chucking on windproof layers over pyjamas and heading out onto the deck at any hour! That sounds pretty exciting to me. I am very optimistic. The M/S Expedition ship comes with lectures and sessions with an on-board pro photographer. Every day, there are talks and informal chats about aspects of the Arctic and polar regions, such as the environment, wildlife, conservation and preservation. That will be invaluable. I can’t wait to learn more about the region and find out what is happening there now, what the future holds and what we, as humanity, need to do. I have been dreaming about being out on the bow or stern of the ship, alone, at some random hour, drifting through ice caps in the Arctic Sea. I am also dreaming of the zodiac expeditions – upto 3 a day – simply floating on an inflatable motorboat through icy blue-tinged glaciers, crystalline glacial caps and sheer walls of ice. Imagine coming across large ice floes topped by a group of seals! Or how about watching glaciers flowing into the sea? I’m imagining the eternal quiet in a part of the world entirely free from chatter, people and noise pollution. 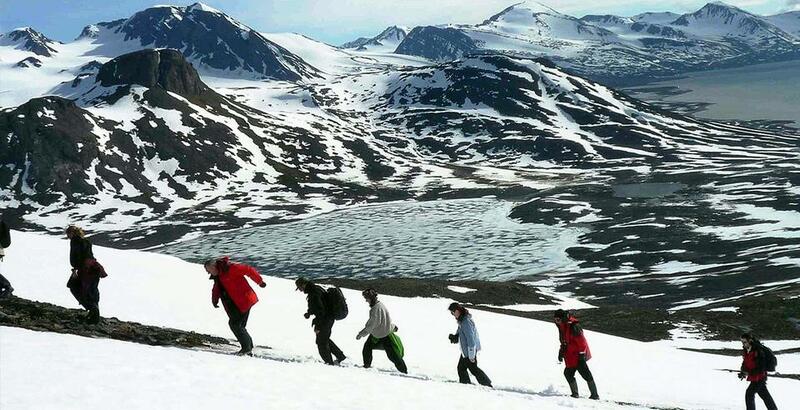 Hiking on the ice tundra and natural fjords through breathtaking mountain scenery will be such a magnificent experience, entering landscapes borne of pure fantasy. And, of course, there’s the wildlife…. 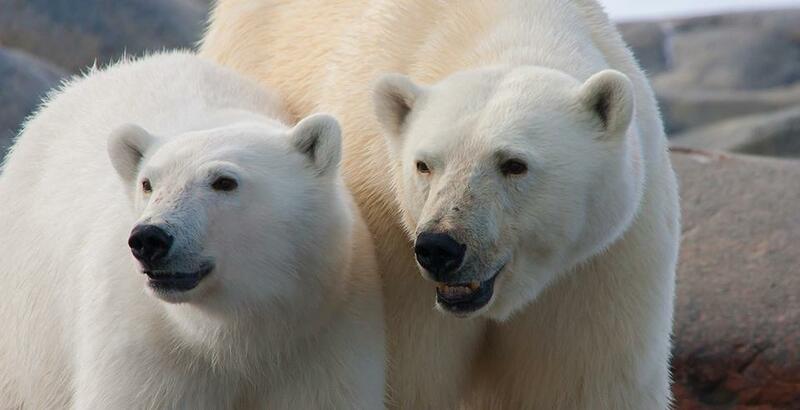 Kings of the Arctic, the Polar bears have been a dream of mine since I was a little girl. The thought of seeing them in the wild brings tears. I don’t mind whether they’re close or a little distance away. I’ve seen videos online of polar bears actually curiously clawing on the ship. To watch the most feared but most spectacular animals of the icy seas, in their environment, either swimming or frolicking on the ice, perhaps even with babies in tow or feeding on a carcass, will be moving. We’re also likely to see Arctic reindeer, walrus, the bearded seal, Arctic fox, sea lions, and potentially, Beluga whales, as well as many bird species, amphibians and plants. As a nature and wildlife-obsessive, this is beyond exciting! The thought of leaving civilisation behind to get close to the North Pole, is the biggest motivator. Heading into the Arctic wilderness, to the remote polar region, on an itinerary, which is ever-evolving dependant on conditions, will be the greatest adventure. I wonder if we’ll be able to entirely circumnavigate Spitsbergen along the Hinlopen Strait, or whether the ice will be too great to allow it. I’m looking forward to spending some time in the bridge, ‘helping’ to search for polar bears and brushing up on all my sea orientation terminology, starting with the basics, such as which side are port and starboard! As a prelude to the voyage, I’ll be spending a couple of days on land in Longyearbyen ‘Land of the Midnight Sun.’ I’ve been reading that the sun doesn’t actually set until mid-August! So it’s possible to walk around at midnight in daylight! My body clock won’t know what’s hit it. It is also a ‘city’ in which reindeer roam freely and polar bears are a threat. In fact, for those considering venturing beyond the ‘city’ borders, it is essential to carry a firearm, which can be rented from Longyearbyen. I have no intention of leaving the boundaries! The flora and fauna looks beautiful in summer and I hope to photograph some of it – Arctic cotton grass, Svalbard poppies and tiny alpines. I’m even excited by the notion of throwing on 4-5 layers, top and bottom, before any potential explorations – and seeing how I go with the cold! It’s going to be rather hilarious walking around as though in a stuffed spacesuit. For the first time in a long time, I have gone out and bought a whole bunch of explorer gear for the weather. I know I feel the cold at anything below 23 deg C (!!!) and below 7-8 deg C, my fingers and toes actually freeze up. So investing in good clothing wasn’t an option, rather a necessity. Worth noting that the gear is not cheap! I’ve bought most basics and relied on a friend who has kindly leant me her skiwear, which is similar. My spend is already at around £600. As a photographer, I maxed the budget further to hire a telephoto lens and weather-proofing for it. The Arctic promises to be a voyage of a lifetime! For a novice with sub-zero temperature trips, I know I’ll gain an entirely new set of experiences and can’t wait to embrace them! Don’t forget to join the journey with me on Twitter @anishahbbc . Tags: Adventure travel, anisha shah, Arctic, bucket list travel, cold weather trip, conservation, Europe, expedition ship, ice, Nature, North Pole, Northern lights, Norway, Outdoors, photography, snow, solo female travel, solo travel, Spitsbergen, Svalbard, travel, Travel Journalist, travel photography, Trip of a Lifetime, Wildlife, wildlife photography. Bookmark the permalink. Can we trade our lives for a few months?! Bon Voyage and this sounds like an incredible adventure! !